William Bruce Arnold, 74, a son of Henry H. "Hap" Arnold, the five-star General, died of leukemia September 21, 1992 at Sibley Memorial Hosp. He lived in Washington, D.C. He was born in Washington, D.C., and was a graduate of Western High School. He spent a year as an Army trooper in a horse cavalry unit at Fort Myer, Virginia, that was commanded by George S. Patton Jr. before entering the US Military Academy. After graduating from West Point in 1943, with a commission in the field artillery, he saw WWII duty in the Pacific. He participated in the campaign for Okinawa and took part in the occupation of Korea. In 1949, he transferred to the Air Force and worked in several of its missile development programs, including the Minuteman and Titan projects. In 1967 and 1968, he served in Vietnam as head of the research and development office of the Advanced Research Projects Agency. From then until his retirement from active duty in 1972, he did legislative liaison work for the Air Force with the Senate. After retirement from the Air Force, Colonel Arnold joined Garrett Corp, a concern making engine parts and other advanced technology equipment. He retired in 1987 as the company's Washington, DC, chief. He also had successfully worked as a private citizen to secure veterans rights for women pilots who transported new warplanes from this country to Europe and the Mediterranean, via Brazil and Africa. More than 30 women died in those operations. Colonel Arnold's father, who had worn the uniform of both a General of the Army and a General of the Air Force, commanded the Army Air Forces in World War II and later was the Air Force's first chief of staff. Gen Arnold died in 1950. WWII, Korea, Vietnam. July 17, 1915-September 21, 1992. He is buried in Section 34 of Arlington National Cemetery, not far from his father. 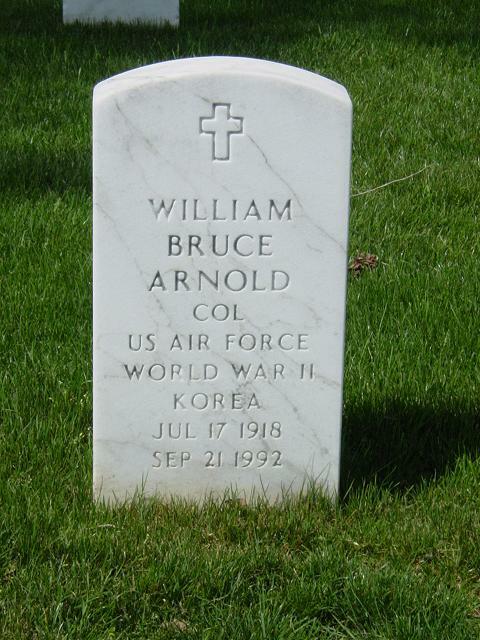 His brother, David Lee Arnold, Colonel, United States Air Force, is also buried nearby.